If you didn’t learn knots when you were young, you can still master them quickly. 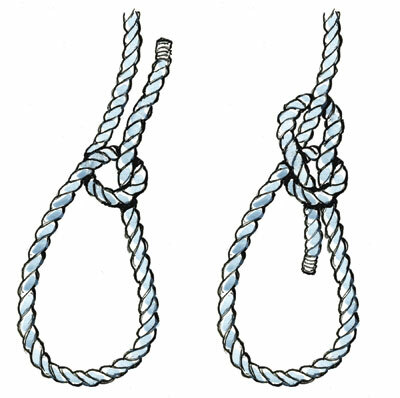 The key is to learn what a given knot should look like when completed, then practice tying it until you can do it with your eyes closed. When studying knots, it helps to know some terms. The ends of a line are referred to as either “working” or “standing.” The working end is free, while the standing end is secured to something. A loop formed in a line is known as a bight. The most useful knot aboard a sailboat is the bowline. It forms a fixed noose at the end of a line that cannot run or slip and is commonly used, for example, to secure sheets to the clew of a headsail. Two bowlines can also be used to connect two lines. The great advantage of a bowline is that no matter how tight it becomes after being loaded for a while, it can always be easily untied. The well known ditty for tying a bowline runs as follows: “The rabbit comes out of the hole, goes around back of the tree, and then jumps back into the hole.” The “rabbit” is the working end of the line; the “hole” and “tree” are formed in the standing end. To finish the knot properly, give a hard pull on the tree and the rabbit’s ears at the same time, so the shape of the knot is not deformed. To untie a bowline, turn the knot over and break its back by bending it downward. Form a closed loop in the line, with the working end passing over the standing end. Pass the working end through the loop, around behind the standing end, then back into the loop. Give a hard pull to close the knot up tight. To untie a bowline, turn the knot over and break its back by bending it downward. To keep a line from pulling through a block or rope clutch, a knot should be tied in the end of it. The most secure knot for doing this is the double overhand stopper knot, known as the stopper knot for short. Unlike a simple overhand knot or a figure eight knot, this knot does not come loose easily. 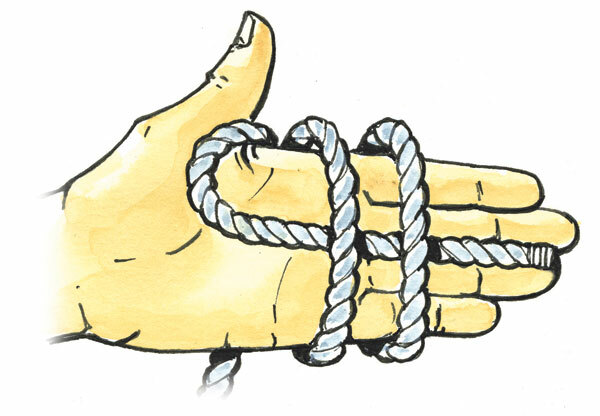 The easiest way to tie a true stopper knot is by using your hand as a form. Just loop the end of the line twice around the palm of your hand, tuck the working end under the two loops, and then pull the loops off your hand. Once you try it, you’ll never use a figure eight again. Working back to front, pass the working end twice around the palm of your open hand. After you’ve got two full wraps, pass the working end under the wraps on your palm away from your thumb. Then use the end to pull the knot tight as it slips off your hand. This is a handy knot because it can be tied very quickly. On sailboats its usual use is for securing fender whips to a lifeline, stanchion base or toerail. It can be easily adjusted to raise or lower a fender as needed. The clove hitch can also be used to temporarily secure a dock line to a piling. However, be aware that the hitch can unexpectedly work free as the boat moves around at the dock. Take one full turn around the object the line is being secured to. Then pass the line over itself as you take another turn. Finish the knot by tucking the working end under itself and pull tight. 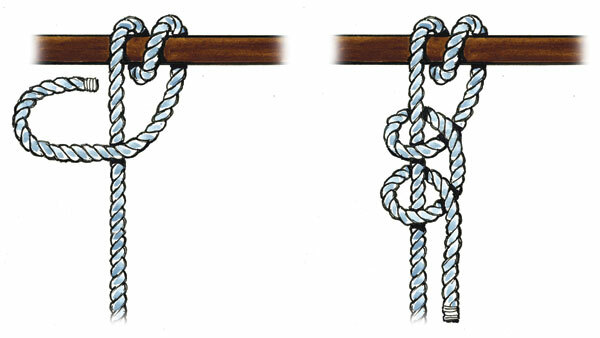 Many sailors use a square knot when tying two lines together, but these often come loose when not under load. The sheet bend is more secure, easy to untie and works better when two lines of unequal diameter need to be tied together. As you can see in the illustration, its final form is only slightly different from a square knot, though it is tied quite differently. Form a bight in the end of one line. Pass the end of the other line through the bight from beneath and around behind both parts of the first line. 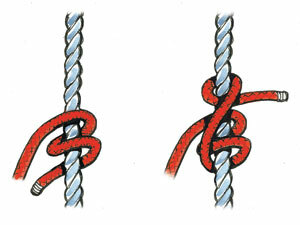 Finish the knot by passing the working end of the second line under itself, then pull the knot tight. This knot has a self-explanatory name: one half hitch, followed by another half hitch. It is easy to tie and forms a running noose that can be made larger or smaller. This is the perfect hitch to use to tie a line tightly around an object. Combined with a round turn, it is an excellent way to secure a dock line to a piling. Tying two half hitches on top of a clove hitch is also the best way to keep a fender whip from slipping. Pass the line twice around the object it is being secured to. Then tie one hitch on top of the turns by passing the working end of the line behind the standing end and pulling it through. Repeat to tie the second hitch. You can tie two half hitches without taking turns first, but they are less secure this way. The rolling hitch comes to the rescue when riding turns jam a line on a winch drum. This hitch is designed not to slip. Use an extra line to tie a rolling hitch on the standing portion of a jammed line, shift the load to the extra line and you can free the jammed line. The rolling hitch will also keep any line secured to a vertical cylindrical object, such as a stanchion, from slipping. It can also be used to form an adjustable noose that doesn’t slip under load. This is handy when securing tie-downs for an awning on deck. Wrap a line twice around another fixed line or post. Take a third turn by passing the working end of the first line over its standing end and then around the second line above the first two turns. Pull on the standing part of the first line and the hitch will not slip down the second line. Walk down a dock in any marina and you will see many dock lines improperly secured to cleats. A proper cleat hitch is easy to tie, very effective and it can be released under load without worrying about losing a finger in the process. 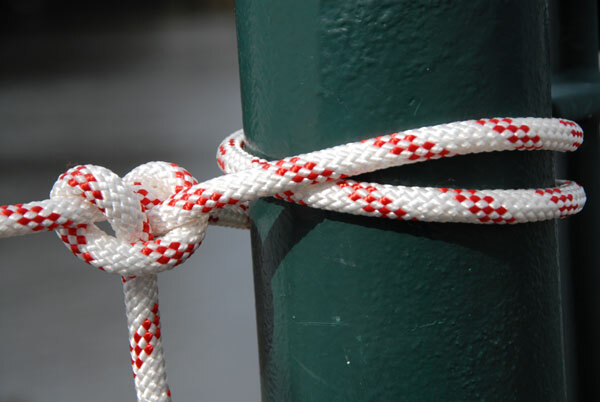 Any time you make off a line on a cleat, on a dock or on deck, this is the knot to use. As you gain experience, you will begin to recognize families of knots that are related. For example, two half hitches and the cleat hitch are really clove hitches. The former is tied on the standing end of a line, while the latter is bent around the horns of a cleat. 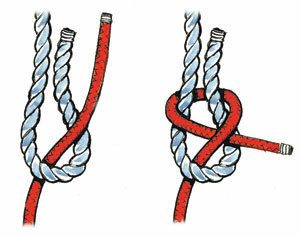 As you practice tying these knots, you will immediately recognize the look and shape of the knot when made correctly. More importantly, you will recognize when you have tied it incorrectly. Take one full turn around the base of the cleat, leading the line so that its standing part runs clear of the cleat. Then take a figure-eight turn around first one horn of the cleat, then the other. On the final turn pass the line under itself and pull it tight. To shop our range of Nautical Ropes, click here.